E Fun might not have the kind of sales volume as Apple does with their fair share of iPads in terms of tablets moved across the counter, but this does not mean that they are not going to roll out any kind of hardware and just give up in the face of the competition. No sir, in fact, E Fun intends to make a splash at the upcoming CES by expanding their range of Nextbook Ares Android tablets by introducing a brand new 2-in-1 model. This particular model will be the 11.6″ Ares 11A, where it boasts of Android 5.1 Lollipop as the operating system of choice, and will be powered by a quad-core Intel Atom x5-Z8300 processor that has 2GB of RAM in order to deliver a pretty smooth performance right from the get go. Expect the Nextbook Ares 11A to hit the market some time in the second quarter of next year as it is accompanied by a recommended sticker price tag of $219.99 a pop. It has been said that the new Ares 11A was specially constructed from ground up in order to have consumers in mind by delivering the right combination of features and price. The Ares 11A itself will come with a detachable backlit keyboard, in addition to a couple of standard 2.0 USB ports (it would have been definitely something if USB 3.0 were thrown into the mix, don’t you think so? 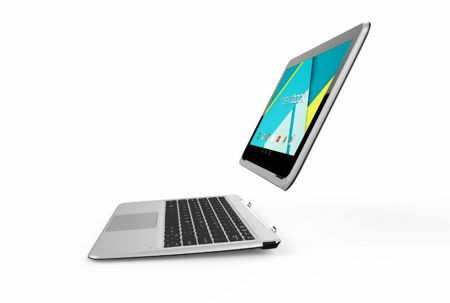 ), a 1366 x 768 IPS capacitive touch screen, a Quad-Core Intel Atom x5-Z8300 processor, 2GB of RAM, 64GB of internal memory that can be further expanded via a microSD memory card slot, Bluetooth 4.0 and WiFi 802.11 b/g/n connectivity, a 2MP shooter in front as well as at the back, miniHDMI and microUSB input. The full-sized, detachable keyboard ensures that work gets done regardless of where you are, and it also handles VUDU or Flixster to keep you entertained on the move without missing a beat, or you can choose to read a digital tome thanks to the preloaded Barnes and Noble NOOK for Android app. Definitely a step up from its predecessor, the Ares 11.